Every so often, I walk away from a conversation thinking how happy the interaction made me feel. My interview with Ethan Dubeau and Luc Paquette was just such an occasion. 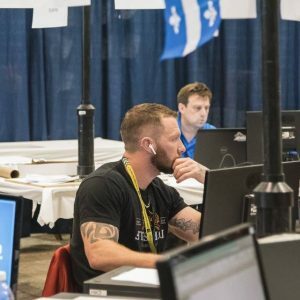 Ethan recently competed at the Quebec Vocational Olympiad on behalf of Team Outaouais in the Residential and Commercial Drafting category, and I was anxious to hear about his experience. Ethan began his studies at the Western Quebec Career Centre in Gatineau in January of 2017. It was his teacher there, Luc Paquette, who encouraged him to consider participating in the Provincial Olympiad. Under Luc’s coaching, Ethan began the training process, which would see him go to the event, held in May of 2018. Having already coached two past participants at the Provincials, Luc knew what to expect and how best to prepare his student. When asked how they got ready, Ethan mentioned that he used the exams from past competitions and worked through these. Luc also noted that preparing for the event really begins from the first competency taught in class. If teachers want to have students who are competition-ready, they must introduce project planning right from the beginning, as this is crucial in being well prepared. A firm understanding of project management needs, as well as market expectations are also extremely important in this field. When asked to describe the event itself, Ethan mentioned that the opening ceremonies were amazing and spectacular. The competing regions marched in, much as you would see athletes from the various countries entering a stadium at the summer Olympics. This really set the tone for what was to come over the following two days. 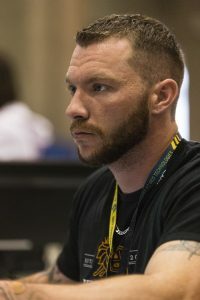 Ethan noted that the entire event was flawlessly organized, and competitors were never in doubt as to what was to take place next. Ethan and Luc met up as early as 6:30 am on the morning of the event, in order to prepare, as coaches and competitors could not interact during the day. This even meant that they could not take their meals together, and competitors needed invigilators to accompany them if they had to step away from their workstations. While this may seem strict, both student and teacher did note that this was important to ensure the integrity of the event. Well prepared for the event, I asked Ethan how he managed to stay focused throughout, given that there were constant visitors observing the competition. He told me that he was happy competitors could listen to music, and so he popped his earphones in and turned on his favorite music, country without too fast a beat, and got to work. He also said that once he reviewed the assigned project, his entire focus was on that and the world around him disappeared. One surprising aspect of the competition was that competitors in this field had the option to select their software. Luc mentioned that in the past, there was no option, but this year, they were able to select between Autocad and Revit. Having done most of his training on Autocad, which is manual in nature, and is the software prescribed by the Ministry of Education for this program, Ethan opted to use this for the competition. However, both he and his teacher did tell me that had they known Revit was an option, they would have chosen this more automated software. Despite this, both had a wonderful experience at the Provincial Olympiad. When I asked Luc if he thought he would coach future participants, his answer was a resounding and enthusiastic “for sure!” When asked what advice he had for future participants in this program, Ethan advised them to take their time, read the instructions carefully before working, and to practice using Revit software. Ethan has now graduated from the Residential and Commercial Drafting Program and hopes to combine his education and his background in construction to a project management career with the company Ellis Don in Ottawa.